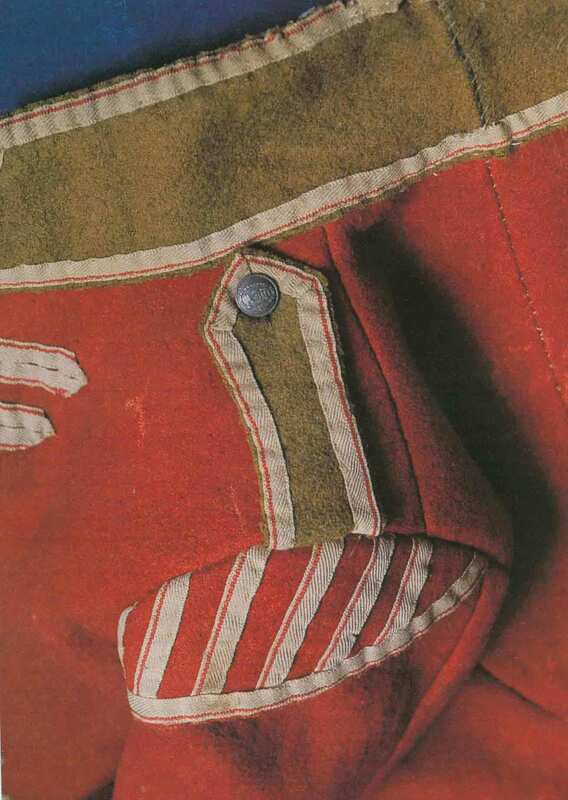 Here, on this page, you will find notes, pictures, files and other information on details of constructing a regimental tunic. 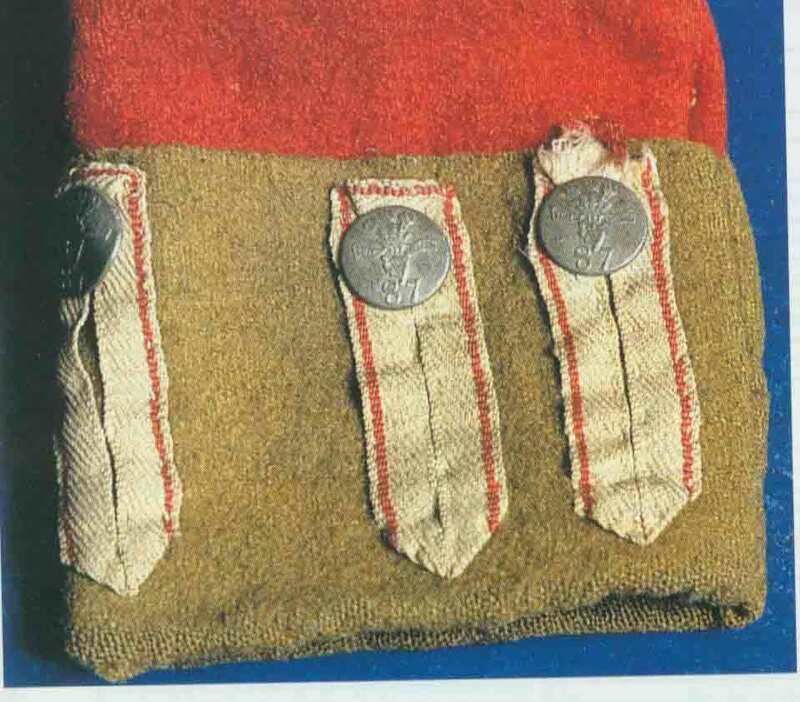 This information may not be complete but is presented to allow the novice to understand the many odd details which the regimental tunic had incorporated into them. Information may change over time as new information, techniques, etc. are found. This file is viewable if your computer has Microsoft PowerPoint installed. The presentation was made to discuss the many odd details which are part of the regimental tunic. The coat used in the presentation is that of an 87th Rgmt grenadier private. This coat is a very close representative to that which the Royal Scots would have worn. 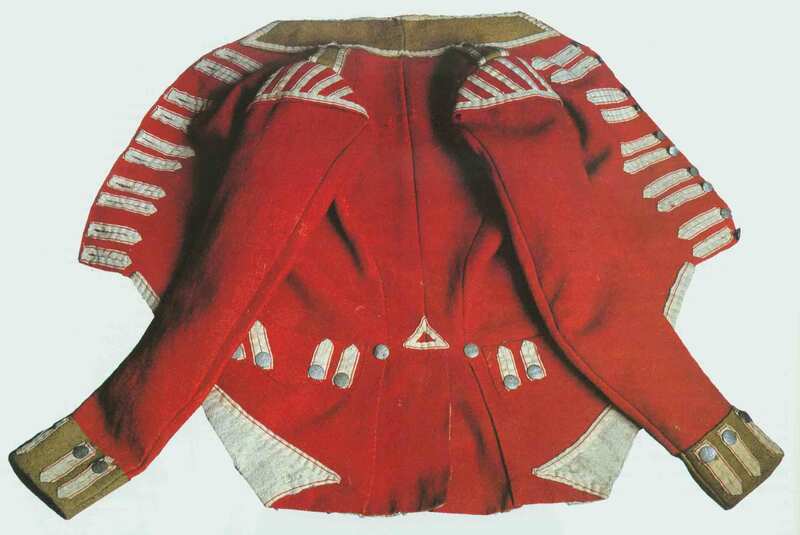 This file is a graphic view of the coat showing the details which should be observed. It was created with Microsoft Excel. 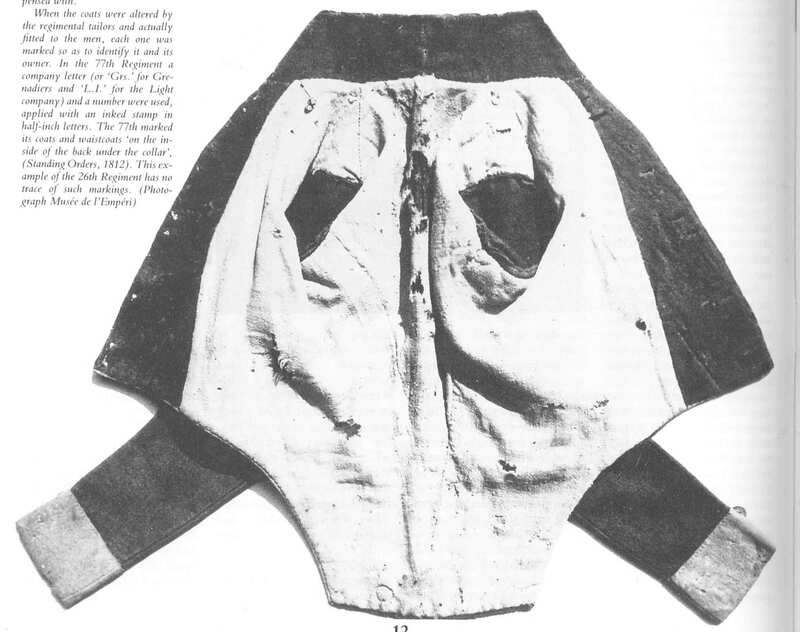 It gives 2 sheets showing the front and rear of the coat. For anyone who is interested strips of sheepskin wool are available from Dave for use on the wings of coats. $4 per strip. 1 inch wide and approximately 18-20 inches long. Enough for 2 wings on 1 coat. These photos are presented as examples to look at to see the details of an actual tunic of the period. 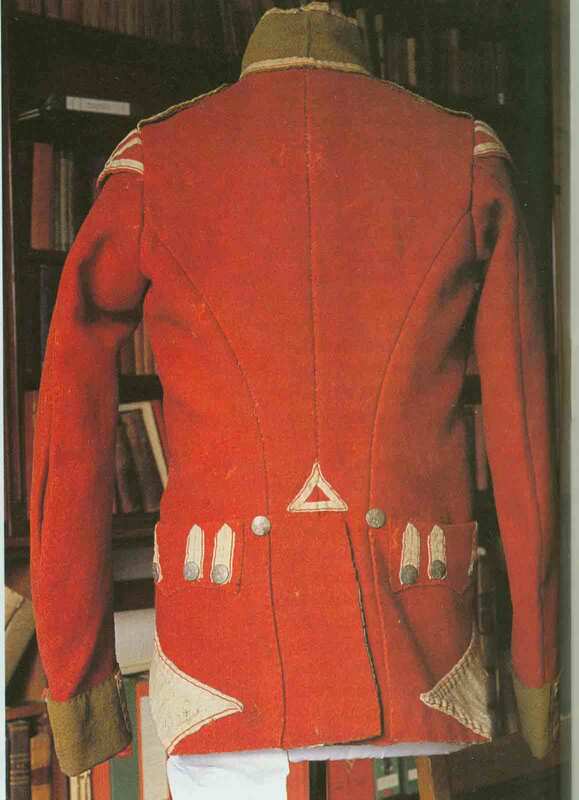 The coat is that of a grenadier private in the 87th Regiment of foot. There are variations in the coat for that of the Royal Scots which are described in other files. The major difference is the lace style. The Third U.S. Infantry Regiment, established in 1784 and still serving, is the oldest infantry regiment in the U.S. Army. Between 1784 and 1815 it was variously known as the First American Regiment, the First Regiment, the First Sub-Legion of the Legion of the United States, and the First (1st) Infantry. During its early years, the regiment garrisoned the posts of the Pennsylvania and Ohio frontier, fought the Indians at the Battle of Fallen Timbers in 1794, and participated in the Niagara-Canada Campaigns of the War of 1812 (Lundy's Lane and the seige of Fort Erie). When the Army reorganized in 1815, the First Infantry was redesignated the Third Infantry, based on the seniority of its regimental commander. Notes and details for U.S. first Infantry transition coat construction will be placed here as information becomes available and is developed. - The coat is all blue, dark. - 33 buttons in total. 2 small and 31 large. The only small buttons are for the shoulder straps and there are only 9 buttons doing up the front of the coat. - Belts are black with small oval brass plate. 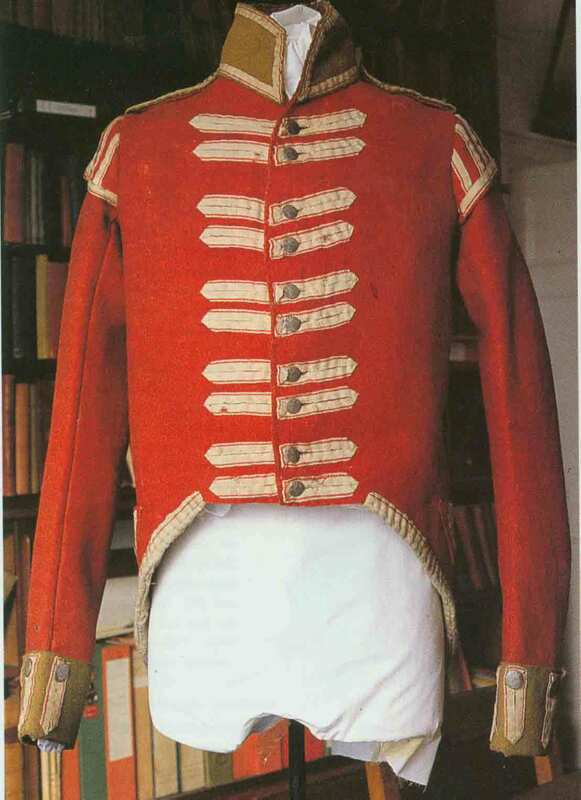 The same pattern which you may make for a redcoat can be used for the blue coat with a few changes. The shoulder seams should be about an inch and half higher up. The space at the small of the back, the narrow panels should be no larger than 5 inches. There is no upper lining. Buttons are available from Kevin Garrett.